The Atlantic Crossing was named Best in the International Smoked Whisky Category. Fleurieu Distillery’s River’s End single malt whisky was awarded a Gold Medal, Best in Class and the Trophy, while its other entry, Atlantic Crossing, won a Silver Medal and was named Best in the International Smoked Whisky Category. The distillery was also awarded a Gold Medal in the Peated Whisky Class with its 61.2 per cent Bogart and Bacall at last month’s Australian Distilled Spirits Awards in Melbourne. “Winning gold nationally and internationally in both peated and single malt categories is a great result for us and for our coastal region,” Andrews said. The trophy-winning River’s End whisky is a unpeated single malt that gets its sweet and salty characteristics from the former Seppeltsfield port barrels it is matured in and the sea air blowing in from the Southern Ocean. River’s End has an ABV of 53 per cent and sells for about $215 for a 700ml bottle while the newly released Atlantic Crossing weighs in at 52 per cent and sells for $198. They are the seventh and eighth whiskies released in the Fleurieu Distillery’s 18-month history selling whisky with batches ranging in size from 200 bottles to 800 bottles per batch. 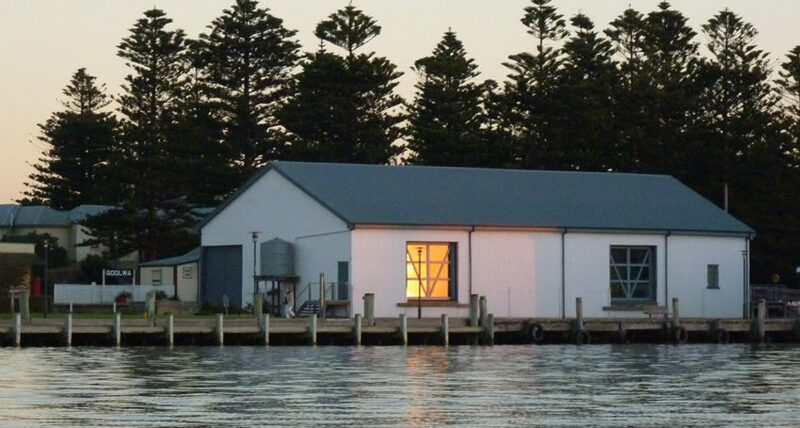 Fleurieu Distillery is right on the River Murray at the Goolwa Wharf. Andrews is having a 36-hectolitre still custom made by Knapp Lewer in Tasmania, which he will pair with his existing Knapp Lewer 12-hectolitre still to ramp up production while maintaining consistency. “With the 36-hectolitre still doing the first distillation, and the second distillation done in our existing 12-hectolitre still, it becomes a more efficient process,” Andrews said. “It’s still hands-on but it will increase in our efficiency and, in time, our output. “We’re doubling our output every year but effectively whatever we produce we’re not finding any difficulty in selling. Andrews said while it was always his dream to become a distiller, more than a decade as a commercial brewer and 28 national and international beer awards had provided a solid foundation for his whisky business. “The beginnings of beer and whisky are very similar and there’s a very good chance I’m the first person to win a gold medal at the Australian beer awards and spirits awards,” he said. “It’s not an overnight thing – you can make gin pretty fast but whisky takes time and patience. The American Distilling Institute Awards have been a happy hunting ground for South Australian craft producers. Adelaide Hills Distillery took out the Trophy for Best International Gin at last year’s awards while this year it was awarded a Silver for its Bitter Orange Apertif The Italian and a Bronze for its 78 Degrees Gin. Fellow Adelaide Hills Distillery Applewood was awarded a Bronze Medal for its Gin and its Okar Amaro. Applewood Distillery also won an Excellence in Packaging Silver Medal for its Espressocello. Fleurieu Distillery’s award-winning whiskies and many other local craft spirits will be available at the Tasting Australia Spirits Awards Party in Adelaide on April 19.